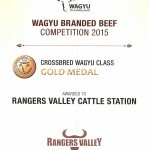 Gold Medal for Rangers Valley Wagyu – Fourth Consecutive Year! 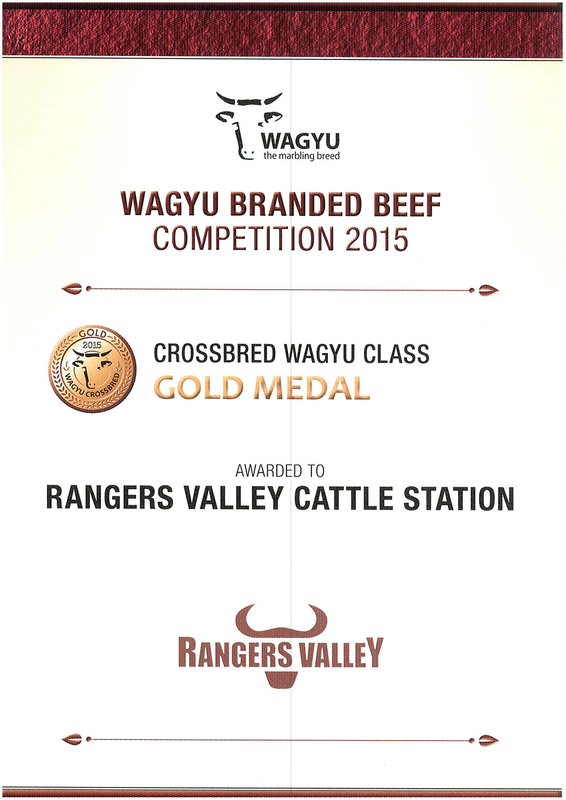 Once again, Rangers Valley Wagyu beef has won a Gold Medal in the Australian Wagyu Associations (AWA) branded beef competition (cross-bred class) held in Yeppoon, Queensland Australia in May this year. This is our fourth year in a row and a win for each year we’ve entered. We couldn’t be more thrilled. To help you feel like you were a part of the judging, we’ve added a photograph below. 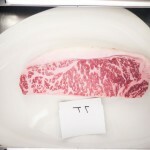 This is the winning piece and an incredible example of the fine cross-bred Wagyu offered to the world by our unique operation here in Glen Innes, the most stunning place in Australia. Okay, so we’re a little proud. That history making cut and the award that it won. Like an episode of CSI Rangers Valley, we traced the award-winning piece of beef back to the breeder, Hornery Family’s Bar H Grazing at River Lea. DNA traceback technology was then employed to tell us the pedigree of this animal. The sire of the winning animal was called ‘W17’ and we can trace his ancestors back 4 generations. This is such an important part of the picture for us. We operate on the well-known fact that the quality we start with informs the quality of our end products. 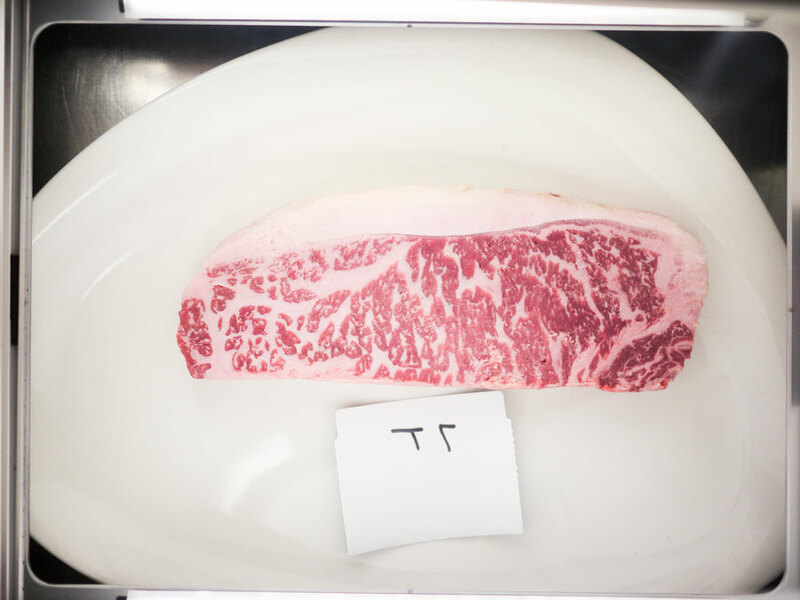 Therefore identifying the potential of young cattle is critical. So, we use all the tools at our disposable, stats, tech, visual appearance, pedigree and that all important gut feel to ensure that only the very best cattle go into our feeding programs. And it’s technology like this that allows Rangers Valley to stay at the top of our game, assessing and maintaining excellent supply chain choices. From our part of the world to yours, we’re raising a glass all through June to celebrate these incredible cuts that we help bring to tables around the world. Cheers! https://www.rangersvalley.com.au/wp-content/uploads/2013/02/rvLogo.png 0 0 Rangers Valley https://www.rangersvalley.com.au/wp-content/uploads/2013/02/rvLogo.png Rangers Valley2015-06-12 06:07:512015-06-12 06:19:02Gold Medal for Rangers Valley Wagyu - Fourth Consecutive Year! Rangers Valley – a virtual panoramic tour. Our 3 favourite things about industry visits.